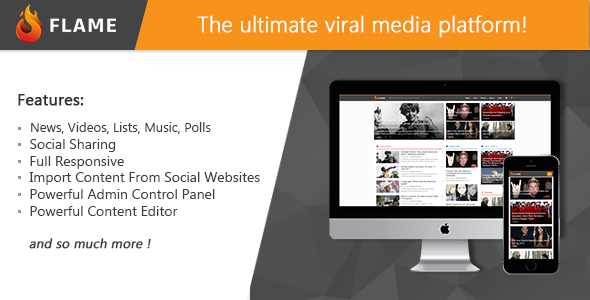 FLAME is a PHP Viral Media Script, FLAME is the best way to start your own social media and viral website ! FLAME is fast, secured, and it will be regularly updated. To start using FLAME or if you want to open a support ticket you need to own a Purchase Code. Where can I get my purchase code ? 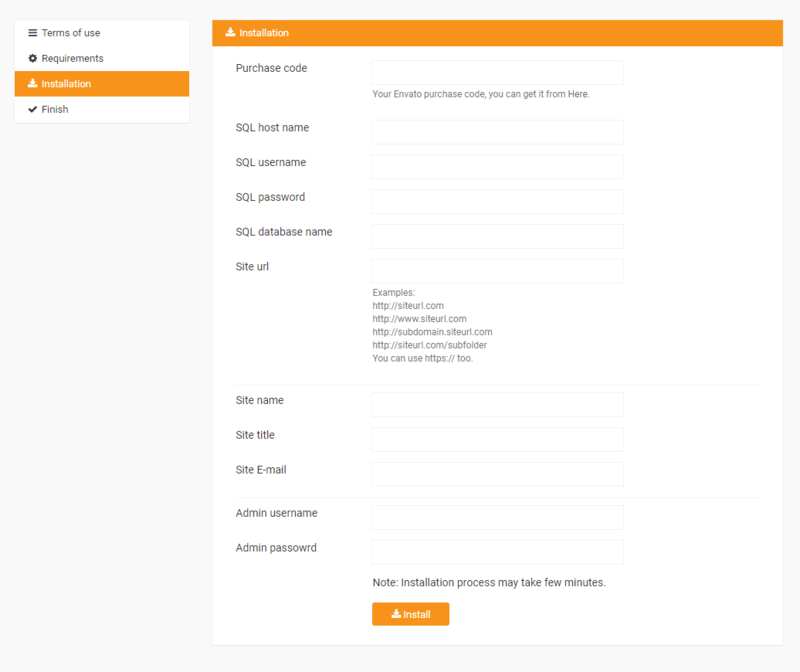 Login to your Envato account. Go to your downloads page. Upload all files/folders located inside "Script" folder to your server. (Don't upload Script folder, upload what inside it). Purchase code: Your Envato purchase code, you can get it from Here. SQL Username: Your MySQL username. SQL Password: Your MySQL user password. SQL Database: Your MySQL database name. Site Name: Your site name, max 32 characters. Site Title: Your site title, max 100 characters. Admin Username: Choose your admin username. Admin Password: Choose your admin password. Once you have wrote the information, please click the install button and wait for a while, the installation process may take up to 5 minutes. What PHP framework FLAME is built on? 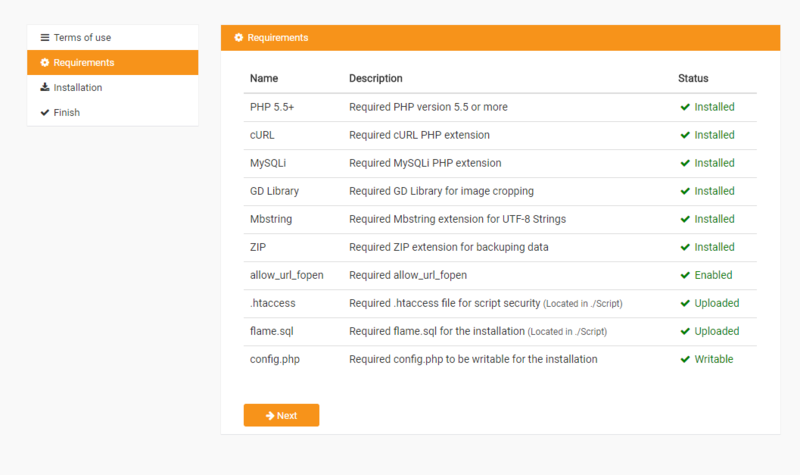 We don’t use any types of frameworks, the script is full pure PHP code. When is the next update coming up? what is the new features ? There is no specified date for every new update, we are announcing the release date before 1 week from the release date in our demo site. Which host provider do you recommend for FLAME? Can I use this in more than one domain? With one purchase license you can use it on one domain name. You need to get new license for each domain name, please check Envato Help Page for more information about licenses http://codecanyon.net/licenses/standard. How to add new language ? Make a copy of english.php, rename it to your language name (should be latin letters, ex: russian.php). Open the file, and start translating the array values. Where can I access the admin panel ? Where can I modify the tamplate ? Where can I edit the stylesheet ? Where I can modify the welcome/home page ? How can I change the logo and design? You can change your logo, favicon, welcome page background image from ./themes/default/img/. How can I edit pages, groups, and classified categories ? How can I edit the countries ? Why I get 404 when I click on any link ? Please make sure that the .htaccess file is uploaded to your server and updated to latest version. Please make sure that the .htaccess file is not empty. If the file is exists, but you still face this issue, please contact your host provide, and let them enable mod_rewrite. Why I get 500 internal service error ? This may cuase due folder permission error, or apache issue, please contact your host provider and let them fix it for you. How can I install SSL ? After you have bought the SSL certificate, go to ./config.php file, find $site_url, replace your site url to https version. How can I redirect my website to SSL version ? Make sure you have SSL working on your domain, and $site_url is set to SSL version in ./config.php file. I can't upload large files, why ? If you can't upload large files, go to Admin > Site Settings > Max upload size and increase the value, if you still can't upload large files, please contact your host provider and let them increase the size. I got a problem, How can I get support ? Please note that our respond can take up to 2 business days. Any support request in our comments section in Envato will be reported and removed. What does the support include ? Availability to answer questions, Answering technical questions about item’s features, Assistance with reported bugs and issues, Help with included 3rd party assets. Any customization request will be ignored. Please read more about the support policay. I have opened a ticket, but there is no respond, why ? If we didn’t respond to you more than 2 days, simply re-send your message, and i’ll contact you soon as I can. Didn't find your asnwer ? feel free to contact us, and we will be happy to help !